This guide shows you the best and most important IPVanish VPN features and how each feature protects you in the real world. Most Internet users don’t know the full list of features offered by this VPN, which is why I’m here to inform you. You should already know this because these modern security features could mean the difference between everyone having access to your sensitive data – or making sure nobody at all can see any of your personal data. (For example, see proof I made that shows how using a VPN stops hackers from seeing your data at public Wifi hotspots like StarBucks). VPN isn’t something you just use for work. Sure – businesses, government agencies and hackers were the first groups of people to start using VPNs. But nowadays, it’s essential for literally every Internet-connected person to use a VPN. This is true especially when you use the Internet in your own home. Without a VPN, many computers along your Internet connection’s “path” are constantly spying on whatever data they can possible view that’s coming from your Internet connection. So as you can see, the need for safe internet connection is increasing by the minute. It is more necessary to establish a secure internet using environment now than ever. Since we are accustomed to using the internet on a regular basis on multiple devices, it is necessary that we take the necessary steps to protect all these devices to make sure your data is secure. How to Ensure Online Data Security? There are two different ways in which you can go about to secure your data. You can either secure your data by installing a particular security app on all your smartphones and computers. Or, using the second method, we secure your Internet connection “at the source”. The first way is simple, but it takes up a lot of your valuable time. It also requires an installation of the security software on every new device that you purchase. Overall, this feature is costly and takes up a lot of space on your device. Basically, using VPN Setup Method #1, you install a VPN app on all your devices – individually. On the other hand, the second method takes a bit of focus to set up initially (just follow my tutorial). But this method also saves a lot of time, since this is the more “wise” way to secure your Internet connection.. This method also helps you save a lot of money and data storage space since you can do it with a single device. The most secure and modern way to secure your internet connection is to use a VPN service. IPVanish is one of the most popular, reliable as well as safe VPN service providers. You can avail the IPVanish services for a small fee paid monthly, tri-monthly, or annually. Several great IPVanish VPN Features come coupled with the use of its services. Some of these notable features are listed below. The primary aim to use a VPN service is to protect your data over unreliable network connections. IPVanish offers the best possible data security using advanced source code algorithms and heavy encryption. With high levels of data security, you can now transmit data between multiple devices over any network with peace of mind. IPVanish allows you to browse the Internet without leaving a trace. Therefore, you can browse the web anonymously. IPVanish masks your IP and therefore gives you unrestricted access to several regions restricted websites. It also helps you bypass any firewall that is installed on the network connection. Therefore, you can create your VPN on a host system without needing any special access through its firewall. One of the best IPVanish VPN features you get with IPVanish is that it never throttles your internet speed. Most of the free VPN service providers as well as a few paid service providers take up a considerable chunk of internet speed during operation, thereby reducing your internet access speed considerably. When working on a project or transmitting files between devices, you do not want the speed to reduce, to work efficiently and quickly. Kodi allows you to access paid content over various devices such as Amazon Fire Stick for free. IPVanish is known to work well with Kodi software. I prefer using IPVanish for watching free movies and TV shows using the Kodi program on my Firestick. Since IPVanish does not throttle the internet connection, you can watch the preferred TV show or movie seamlessly in HD without any buffer or lag. IPVanish effectively provides an end to end encryption for your network. Therefore, it does not leave any loophole that the hacker or government can manipulate to access your personal files. With this end to end encryption, you can visit any site in the world with the assurance that no client can monitor your activity or steal your data over the Internet. One of the IPVanish VPN features that make it so attractive and popular is its extensive support. IPVanish is supported over a variety of platforms and devices. You can use the IPVanish services over Android, iOS, Linux, Windows, Mac OS, Fire TV, Windows Phone, Chromebook as well as routers. It is preferable to use the IPVanish service directly over the router to ensure that all your devices connected to the router automatically get the benefits of using the internet anonymously. You can visit the guide on my page to know more about “how to set up a GLI mini router” as an IPVanish VPN device. It is an outstanding IPVanish VPN features that keeps you anonymous. Most of the VPN service providers keep logs of the browsing history for their users. However, IPVanish follows a strict no-log policy. This no-log policy suggests that IPVanish does not keep track of your activity over the Internet when you access it via the VPN service. This policy allows you to access the websites truly anonymously without anyone spying on you. The IPVanish services are available at a minimal cost. Most of the other paid VPN service providers do not offer such price to their users. Combine this small price tag with a long list of features, and you get the best VPN service possible. You also get a massive discount on paying for the service on tri-monthly or an annual basis. Check out the official website to know more about the pricing options. You can also get a hefty discount using the coupon code on my website. IPVanish offers the widest range of VPN networks to you. IPVanish offers over 40,000 shared IPs to you. It also offers over 850 different VPN servers in more than 60 countries. The best part about the IPVanish service is that it is steadily growing at an exponential rate. Thereby, adding more active networks to its profile every day. Apart from data security, the number one reason that you should use a VPN service is to protect your online identity. The advancements in cloud computing technologies, as well as internet banking, has forced people to use online modes of handling finance. You can be facing a severe financial loss in case someone steals your online identity and misuses it. IPVanish also offers you with ant-geo-tracking capabilities. This IPVanish VPN feature allows you to securely browse the internet without revealing your current location to anyone in the world. Several social media applications and websites track your active location in the background without permission. To allow your children use these social media applications safely, you must invest in a good VPN service, which keeps their location anonymous and away from predators. Several internet-based services cost you depending upon the location you use your internet from. With IPVanish you have the freedom to choose the VPN service from over 60 different countries. Therefore, you can now determine a country’s access point that costs you less to use the particular service. The IPVanish service can be used for multiple devices at a time. You can use a singular IPVanish account over five different devices at a time. However, it is better to associate your IPVanish account to a router instead, which can then be used to connect many devices. This way, you do not have to download a dedicated IPVanish application for each device. IPVanish has got you covered if you do not know how to set up a router with the IPVanish services. You can download dedicated apps on almost all different platforms, which help you link your device to the service, thereby helping you browse the internet anonymously. The applications are easy to set up and have an intuitive click to run interface. In fact, it also comes with a VPN kill-switch that will not allow you to connect to an unsafe internet network. The IPVanish service providers use the latest 256-bit AES encryption to secure the networks and provide the VPN services. Using heavy encryption on the devices allow you to access the internet much more safely. Apart from these 15 IPVanish VPN features, IPVanish service offers several other features like extended customer support, unlimited server switching option, as well as money back guarantee. 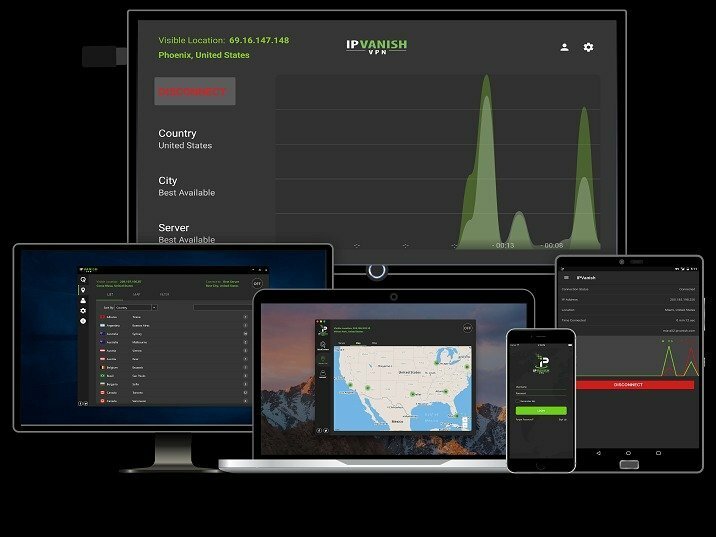 Do check out the IPVanish official website for more information and IPVanish VPN features. Hi Keith, IPVanish works better than fine over a fiber connection. Their servers are directly attached to the internet’s backbone, so you should see very little change in throughput speeds. I don’t see any need to wait, as a VPN will protect you in many ways no matter what kind of connection you have. It’s more about hiding the data you are making available to the internet at large when you go online. Enjoy and keep safe! I’m presently using a Netgear router, in April I will be using an Asus router, will I be able to change routers at that time?